Fifa has opened disciplinary proceedings over the Republic of Ireland's use of a logo to commemorate the centenary of the Easter Rising. 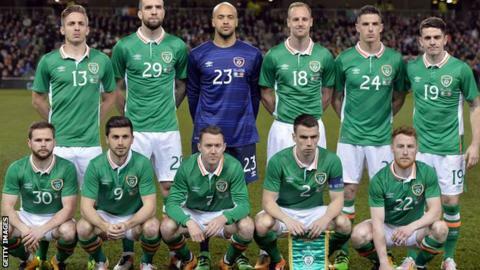 The Republic's players had the years 1916-2016 on their shirts during a friendly against Switzerland in March. Fifa's decision comes amid discussions with the English and Scottish football associations over wearing poppies for their Armistice Day match. The most likely punishment will be a fine, the BBC's Richard Conway reports. A Fifa spokeswoman confirmed proceedings had been opened, adding: "We cannot comment further at this stage nor speculate on any outcome." The Football Association of Ireland has declined to comment. The Easter Rising was an Irish rebellion against British rule, which lasted from 24 to 29 April 1916 and resulted in 485 deaths. Read more: What was the Easter Rising? England and Scotland have used the Ireland example in their negotiations with Fifa over whether they can wear poppies on black armbands when they meet in a World Cup qualifier on 11 November. The two FAs say they will defy any ban and are willing to accept any punishment handed down by the world governing body. Before the investigation began, Fifa had been accused of double standards over the Republic's use of the Easter Rising logo. Damian Collins MP, chairman of the Commons' Culture, Media and Sport select committee, called on Fifa to "clarify the issue", adding that it appeared to be "an absolutely classic example of leniency being shown to other countries". The International Football Association Board (Ifab) - made up of the four British FAs and Fifa - is responsible for formulating the laws of the game, which are then upheld by Fifa. The laws cover everything from the field of play to the equipment used and how the result of a game is determined. A section of law four, which deals specifically with players' equipment, reads: "Equipment must not have any political, religious or personal slogans, statements or images. "Players must not reveal undergarments that show political, religious, personal slogans, statements or images, or advertising other than the manufacturer's logo. "For any infringement the player and/or the team will be sanctioned by the competition organiser, national football association or to be justified by Fifa." It does not specify what the sanctions are for breaching those rules.